Bus from Shah Alam to Teluk Intan is one of the favourite bus route for locals travelling between the two cities. By taking direct bus from Shah Alam to Teluk Intan now, passengers save time from travelling to Kuala Lumpur TBS to take bus to Teluk Intan. Transnasional is the one and only brand serving bus from Shah Alam to Teluk Intan. The national transport operator is the leader in the express bus industry and is also one of the most well-known bus company brand in Malaysia. Transnasional is having up to 6 daily departures. Their first bus starts at 9.00am and the last bus leaves the bus terminal at 9.30pm. The duration required for bus from Shah Alam to Teluk Intan is about 2.25 hours, depending on traffic and climate condition. The fare for this bus route is fairly charged at RM 14.80 for adult and RM 11.10 for child. For short distance journey, the coach has no routine stopover for washroom break. However, in the event of urgency, passengers may request for a stopover to driver. The pick-up point in Shah Alam is at Shah Alam Seksyen 13. Passengers prefer this pick-up location because of the convenient access to Shah Alam Bus Terminal located at Seksyen 13 via intercity bus and taxi. The drop-off point at Teluk Intan is Stesyen Bus Bersatu located at the Teluk Intan new town area. Booking online has now been made easier with BusOnlineTicket.com. 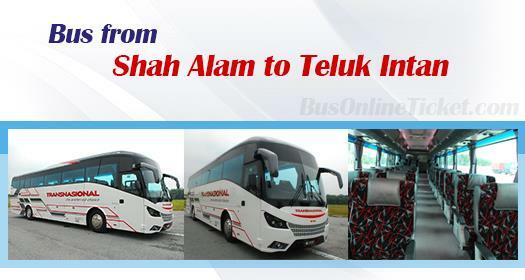 Book your bus ticket from Shah Alam to Teluk Intan online now to secure your seat and cut short the waiting time. You can make your payment securely via online payment. After that, you will receive instant confirmation upon successful payment. It's very easy, simple and quick!